These Sellex bakelite canisters ‘Rice’ and ‘Coffee’ have been separated from their larger red-lidded set [flour, tea and sugar…] but Kanga and Roo are in their entirety; Roo being the pepper, and Kanga – the salt. I’m sure someone out there has the rest of the Sellex set – or at least wants to add to canisters already collected. The ceramic kanga and roo S& P shaker set is adorable and in perfect condition. Make someone’s Christmas wishes come true! These Sellex bakelite canisters ‘Rice’ and ‘Coffee’ have been separated from their larger red-lidded set [flour, tea and sugar…] but Kanga and Roo are in their entirety; Roo being the pepper, and Kanga – the salt. I had already posted this kitschy set, but the kanga and roo were bought. Then another kanga and roo came into my life! and so I am able to once again offer it for sale. I’m sure someone out there has the rest of the Sellex set – or at least wants to add to canisters already collected. The rice label is a little worn, but both bakelite canisters are in perfect nick [check the image.] 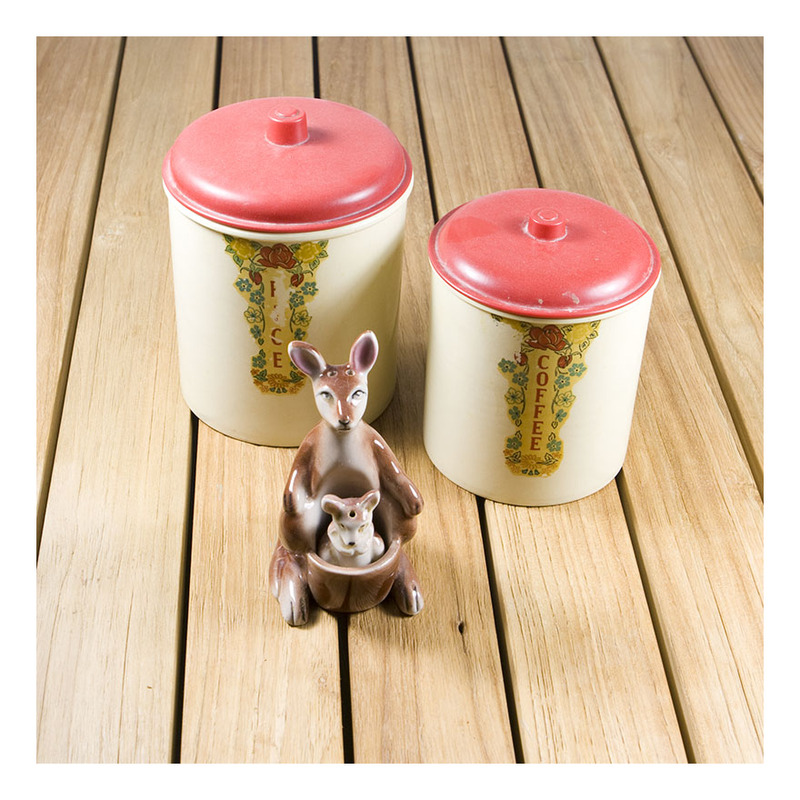 The ceramic kanga and roo S& P shaker set is adorable and in perfect condition. 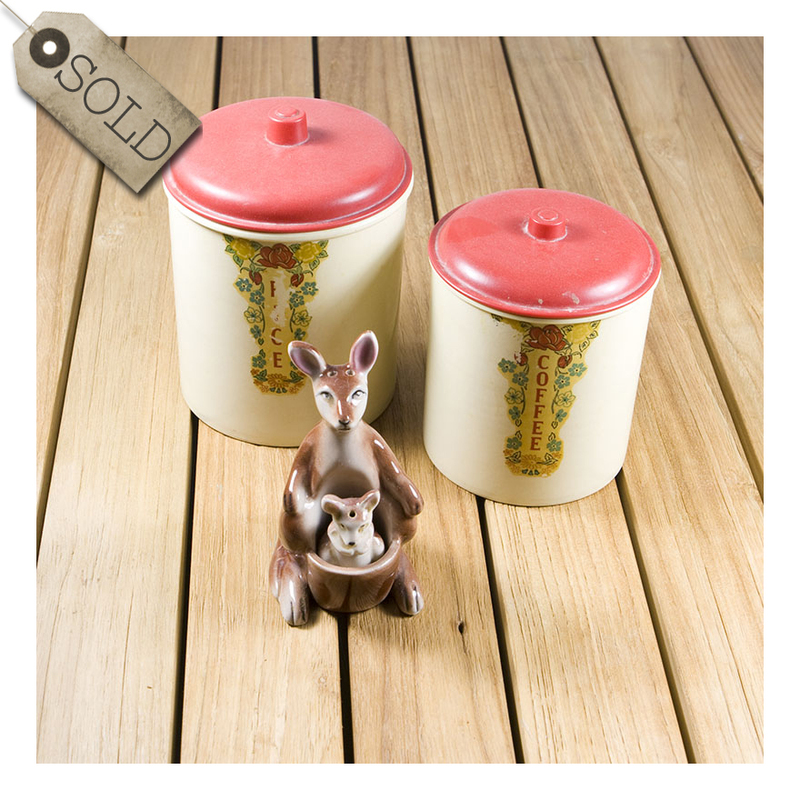 postscript : Kanga and Roo have been sold, but the canisters are still up for grabs!